(CNN) -- Spain's Gonzalo Fernandez-Castano and English duo Anthony Wall and David Horsey share the lead after the opening round of the BMW PGA Championship at Wentworth on Thursday. 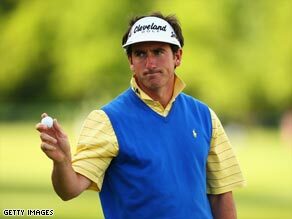 Spain's Gonzalo Fernandez-Castano is among a trio of players who carded an opening 67 at Wentworth. The trio carded five-under-par 67s to hold a one-stroke advantage over a group of five players including holder Miguel Angel Jimenez. Surprise package Horsey, the winner of last year's European Challenge Tour, carded his round despite teeing off in the first group at 7:00am. "I'm not really a morning person and that was a bit of a culture shock, but to go out first is a bit of an advantage. Good greens, no wind, no hold-ups," he told reporters. The day's big surprise was the performance of Players Championship winner Henrik Stenson. The Swede, who is ranked fourth in the world after his Florida victory two weeks ago, maintained his poor record around the course with a six-over-par 78. Other big names to struggle included Masters champions Angel Cabrera (74) and 2005 US Open champions Michael Campbell (78), while both John Daly and Ernie Els carded 73s. Meanwhile, Shane Lowry, European golf's newest star, has turned professional and will make his debut in next week's European Open at the London Club in Kent.